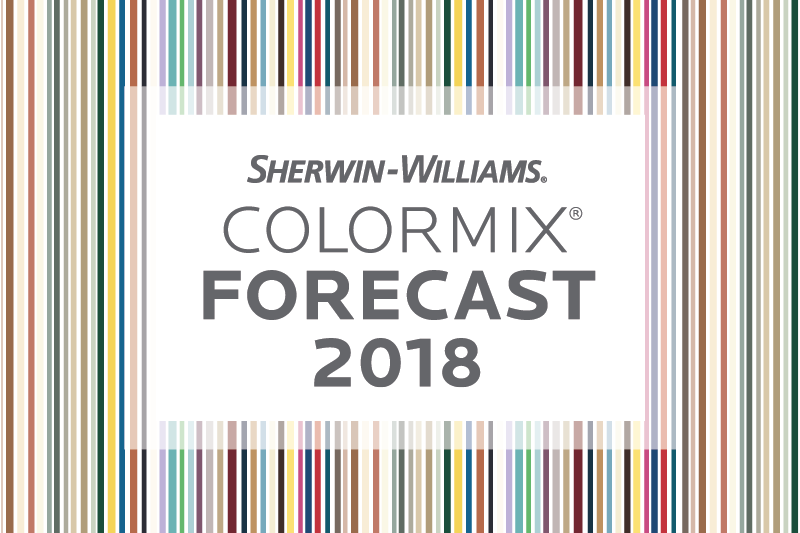 From vivid blue and digital green, to high-def yellow and rusty auburn, the Sherwin-Williams 2018 Colormix Color Forecast exhibits three colour palettes that draw from emerging global trends. The collection predicts the colours that will drive conversation and inspiration for the coming year, offering new perspectives on societal influences and their impact on colour and design trends. The Sherwin-Williams Color Forecast team, led by Sue Wadden, director of colour marketing, identified 36 colours drawing from fashion, nature, pop culture and global design, to create the Colormix palettes Sincerity, Affinity and Connectivity. The softest of the three palettes is influenced by “silence, Instagram, minimalism, hygge and normcore,” according to the company website. The hushed tones are aimed to blend to create peace and space. The loudest and most vibrant of the palettes is influenced by roaming, transculturalism, community, artisanal crafts and indigenous patterns with pops of color in Exuberant Pink and Indigo. A tech-inspired, heavily cool-tempered palette, this collection draws from California pop/youth culture, techies, virtual reality, productivity and environmentalism.